SAINT PETERSBURG: Paramedics tended to Argentina legend Diego Maradona after he fell ill after cheering on his country as they scored late against Nigeria to stay in the World Cup on Tuesday, according to reports. Maradona, 57, had been visibly emotional during the match in Saint Petersburg that Argentina had to win to stay in the tournament. 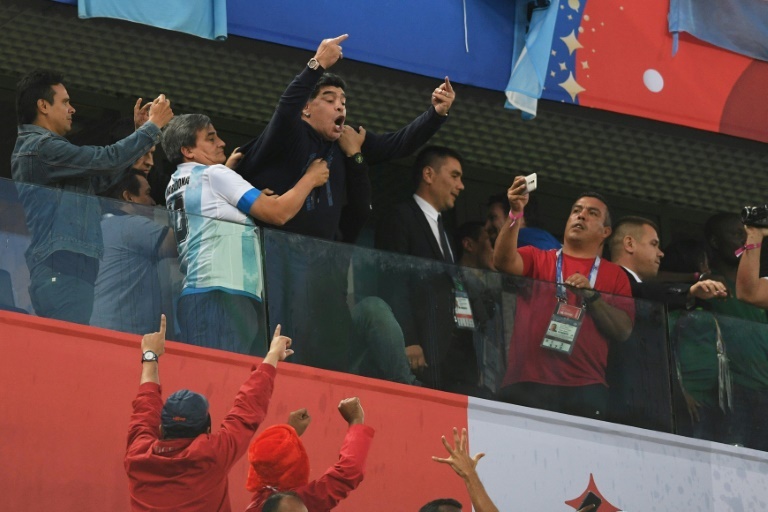 When Marcos Rojo scored the winning goal in the 86th minute, Maradona leaned over the front of the VIP box from where he was watching with friends and made a one-fingered salute while shouting an obscene insult. A video later emerged showing the 1986 World Cup winner looking unwell, walking with difficulty and being guided into the dining room of the VIP section by two friends and then sitting in a chair. Other photographs showed two uniformed paramedics attending to him, with one appearing to take his pulse. Argentina media reported that Maradona had suffered a spike in his blood pressure. Argentinian newspaper Ole reported that Maradona was able to walk and had gone to his hotel.